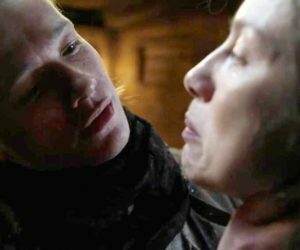 Outlander Podcast Hosts Mary & Blake discuss Outlander episode 4.05, “Savages”. Cheryl Poms, Angie Leith, Summer Sheker, Dianne Karpowicz, Lynda, Carolyn Needham, Patricia Barron Tardio, Celine Moore, Mary Greer, Michelle Osteria, Jennifer Wilson-Veil, Heather Mohr, Marilyn Neenan. Re your thoughts on the trailer for the next episode, I shared your reaction. However, maybe there is nothing they could have shown from episode 4.6 that would be non-spoiler. Maybe the entire episode is full of spoilers and so they went with LJG and Willie because David Berry has been promoting the show and most people probably know he’ll be on it and because of that, Willie might be on it, too. Willie is not a big factor in S4 so maybe they didn’t think it would be much of a spoiler? And yes, it is odd that the opening credits clearly indicate Roger goes back in time. Not sure why they included that clip but maybe they figured most viewers would assume the character does go back? I think the reference to 1768 is a mistake in the show. It has to be 1769 considering that Claire returns in December 1766 (basically 1767 for all intents and purposes) and then it takes several months to voyage to Jamaica. Then they shipwreck on colonies and they’ve been there awhile before Jamie starts building the cabin and we have to assume that takes many months, too. Also, if Jamie says Bree is in 1971, then he is in 1769 because the difference is 202 years, not 203 years. That’s how it is in books and that’s what they’ve been working with in the show. A 202 year difference. So a show mistake in this case! I’m surprised no one picked up on and/or mentioned in the podcast Murtagh’s reaction when Ian stated Jamie was looking to make a present for his wife. 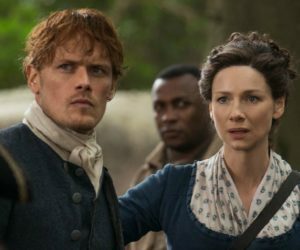 It was so masterfully subtle – that little side eye he gives when he says, “you remarried?” What he was really saying was, “No frackin’ way am I melting down my beloved Ellen’s silver candlestick for you to give as a present to your second fiddle, Claire knock-off of a wife. HOW DARE YOU betray every woman who has ever meant anything to both of us!” It just makes Jamie’s reveal about Claire’s return that much sweeter in the end. It was PERFECT. Erika….LOL! Maybe I was projecting, but when Murtagh assumed Jamie remarried, he looked a bit sad or disappointed. His reaction to hearing that Claire had returned was marvelous! I love the show but people have pointed out a couple of possible plot holes involving Murtagh. One, why did he not think about writing a letter to Jenny asking about Jamie? And two, Jamie just completed an amazing home for his family. Wouldn’t he have required the services of a blacksmith as he was building the home? It seems Murtagh is the closest one! Re. the letter to Jenny, I suppose it’s possible he did send a letter but it never reached the Murrays. The postal service was probably not up to the same standards as today’s. Not all letters were received. Or maybe Murtagh was afraid to know the answer. He also couldn’t ask Jocasta because he probably doesn’t know Jocasta is in the colonies…she and her husband left for the colonies after the rising and Murtagh was imprisoned. My Good was Murtagh!!! From the moment I heard his voice, to the reunion with Jamie, to having him be opposed to Jamie as a Regulator, I’m so freakin happy he’s here with us again!! My Bad was everything that wasn’t Murtagh!! Herr Mueller, you broke my heart!! Adawehi gets far too little screen time, but what we did get is so lovely and informative as to her character, I wish we had more time with her, truly. MURTAGH IS BACK YOU GUYS!!!! He’s back, and it’s awesome, and BLAKE, I know you hated The Search, but seriously, hearing Murtagh whistle Boogie Woogie Bugle Boy, then watching the look on Claire’s face as the tune registers, omg, it justifies THE HECK outta The Search, It was ALL WORTH IT JUST FOR THIS!!! And have you EVER seen Murtagh SMILE like that?!?!?! He’s so happy to see his dear Claire, and she’s so happy to see him, and I’m dead!!! The Search may not have been liked by everybody, but I loved it because it showed our Murtagh bonding with Claire, in a way they never did in the books, endearing him to us so much more than we ever expected. To have him return, now, in this way, it just tickles me pink to have him rejoining our growing Fraser’s Ridge Family. Even throwing in his opposing views on Tryon’s Tax Goonies doesn’t bother me, I know they’ll use that drama to good purpose in future episodes. Oh, I’m so dang happy!!!! The theme of this episode is “That’s not how they see it”, and it is so poignant, but it just rips my heart out that the settlers and the natives cannot, for the most part, find their common ground, and coexist in a peaceful way. The settlers see nothing but dirty heathens, and the Cherokee see nothing but greedy invaders…it’s truly a great tragedy played out on both epic and miniscule scales. 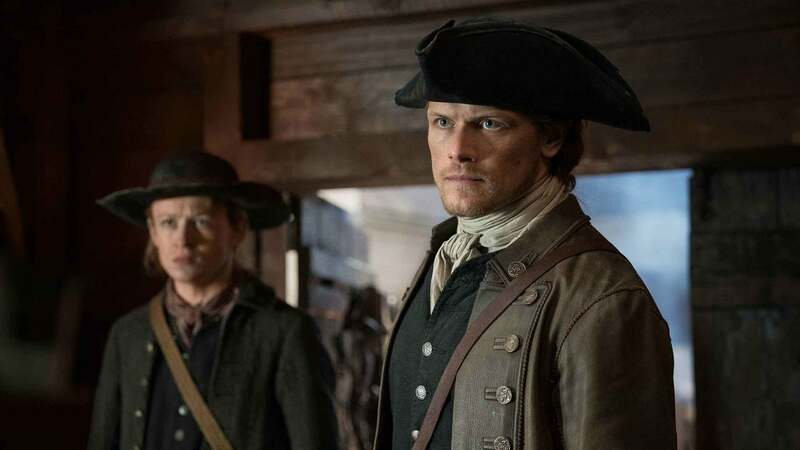 This theme even touches Jamie and Murtagh, as one sees the Law that must be upheld by an oath, and the other sees the injustice that must be avenged. AAAHHH, this show is on it!! The end scenes with Bree at the stones while Roger reads her letter, beautifully done, so simple, yet effective. I can’t wait to get to see her in the past, it’s when she really comes alive! As for the spoilerific preview, yeah, they kinda jumped the gun on this one, but honestly, they’ve been doing that since the beginning. They always give stuff away, just stop watching the previews, they can’t help themselves. Can’t wait for next week!!!??? Oh, and that hussy better step off, and keep her bad juju to herself!!! I smell a skank!!!? Five kilt rating all the way. I just loved the episode and it felt just like coming home with seeing Murtah! He’s back and it’s about time. Pass the tissues! I actually felt my heart melt when I heard his voice with his reunion with Jamie. They can pack so much underlying emotions in their dynamics together in just a few words. After seeing so many strangers with Jamie and Claire in Season 4, it was wonderful seeing a character we knew and become attached to. It was the relationship aspect that I think had been missing from this season up until now. When he started whistling “Boogie, Woogie Boy Of Company B” and Claire turned around, it brought back memories of The Search. 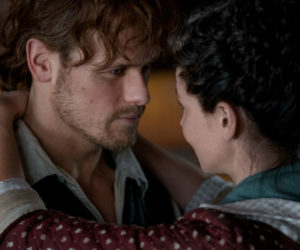 And even more how in that episode Claire and Murtagh started to bond over their love of Jamie. Can’t WAIT to see Lord John and Willie as per the coming attractions, maybe they were very much a spoiler, and they seemed to be purposely thrown in, but what the hell, I can’t wait! In the book the herbs were to prevent pregnancy so I guess I am confused why they were changed to helping with delivery. Because both Brianna and Marsali would have need of something to prevent pregnancy. I liked your point about tension happening first with the “savages” and then Murtagh with the Regulators. I flashed back to the scene of Claire and Mrs. Graham in the garden and Claire saying “there’s always another f**king war!” No one would blame Claire for being weary of war as she would have also seen the Korean conflict, the Cold War, and Viet Nam and now knowing she will live through the Revolution. Is emotionality a word? Isn’t it just emotion ? Yes it has to be 1769- and yes in the books – Jocasta sends them lots of furniture and animals – so good note. What did Jaime say under his breath when he first recognizes Murtagh? Is it Gaelic? This episode was just terrific! I think Murtagh will be brought into the knowledge of what’s to come and will make the right choice. The second sight with Jaime is also brought out a number of times in the books and may lead to the reason he’s a ghost looking up at Claire in episode 101. Funny funny note about Ian – so cute and slapstick.